I plan to send you a PM about this in due course OR - it might not be for a day or so though, as I'm awaiting some information. But you may be quite interested in the "lateral thinking" involved. I felt I ought to point out though that not everyone agrees that the approach referred to is the safest. There is a better way. 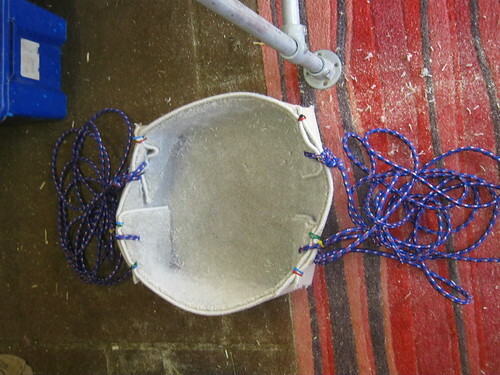 When we were digging upwards in Bath Swallet we developed the Parrot Perch system using cheap plastic sink drainage pipes. The pipes are light and easy to carry and can be adjusted to securely hold a suitable charge in place. Typically the top of the pipe has a T piece with the plastic cut to hold a stick hard against the rock. The pipe can be extended with cheap of the shelf joins and angles and can also be used to probe any loose debris without being directly underneath. make more cave - we have the technology! 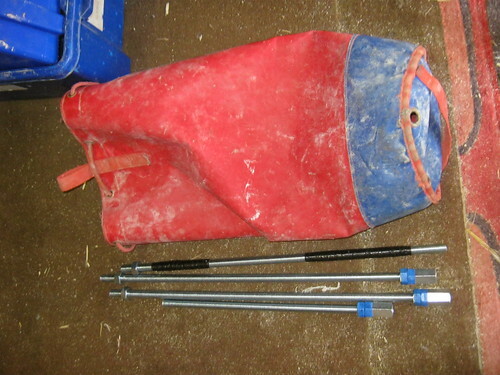 I used a railway shunting pole about 6 ft long with a army pick/spade fold up down or angle fitted on the end for the Hillocks/Knotlow dig strong good handling and not to heavy. I've cut 3 lengths of rod to 60 cm (perfect tackle sack length) and used an off cut at 40 cm for the poking end. Given the thread on the poking end will inevitably get knackered I wanted that section to be identifiable. A different length was an obvious option. 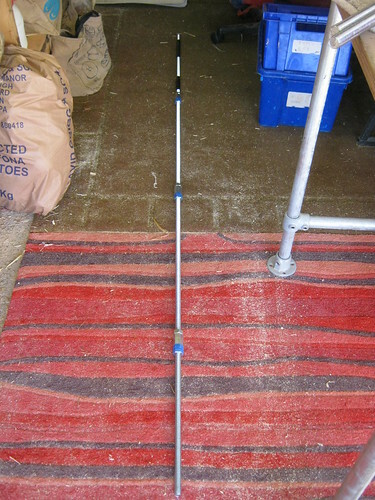 Total length is obviously 220 cm, though leaving out one section to give a rod length of 160 cm looks very usable and is quite a bit lighter / more manoeuvrable. I've found the rod connector alone doesn't work - additional nuts on both sides are needed to lock the sections. Without these the rod sections started to come loose when I did some test poking in the garage. One side of the connector I've tighten with vice / big spanner and then taped (to make it clear which side it is) as a permanent fitting. The other can be nipped up against this with a small adjustable down the cave. Then a good smattering of duck tape on the first section where it will be held to make it more comfortable to hold. Just need to find some loose boulders now to see it if it works. I'll report back. If you've read any of the Portland digging reports, then you've probably seen reference to carpet drag trays. Having made another today I thought I'd photograph it as well. The carpet tiles are x-sample tiles from a local carpet shop. If you catch them on a good day they're free, otherwise they seem to be 50p each. They are surprisingly robust - we've not killed one yet, though the first I made around 9 months ago is now looking a bit sorry for itself. They are flexible so find their way around corners / though constriction better than something rigid.